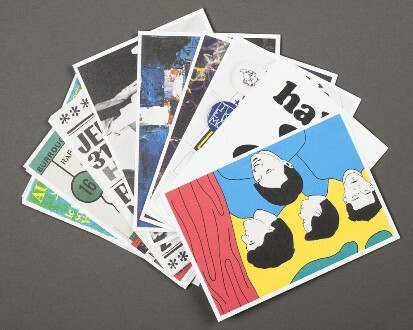 In association with Polite Company we have produced a boxed set of 25 art quality postcards featuring classic designs and images associated with Crépuscule and Factory Benelux between 1979 and 2014. Featured sleeve and poster artists include Benoît Hennebert, Jean-François Octave, Claude Stassart and Marc Borgers. Featured photographers include Charles Van Hoorick, Annik Honoré, Marc Portée, Marc Monin, Gilles Martin and Amy K. Walker. £25.00 plus postage. 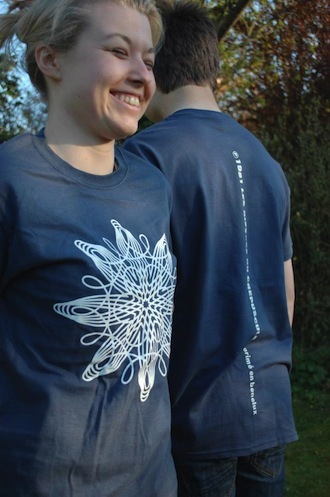 Les Disques du Crépuscule spiral/star t-shirt - off-white print front and back on blue dusk Gildan cotton shirt. Sizes available: S, M, L, XL and XXL (European cut). £16.00 plus postage. Crépuscule au Japon t-shirt - red and white print front and back on dark navy Fruit of the Loom cotton shirt. Sizes available: S, M, L, XL and XXL (European cut). £16.00 plus postage. Crépuscule vinyl slipmat - the classic white spiral design printed on high quality black slipmat. Ideal for tunrtablists everywhere. £12.00 plus postage. Josef K The Only Fun In Town t-shirt - gold print front and back on black Fruit of the Loom cotton shirt. Sizes available: S, M, L, XL and XXL (European cut). £16.00 plus postage. Limited edition reproduction (x320) of the celebrated Les Disques du Crépuscule button badge from 1981, an ironic comment on Brussels nightlife. Free to customers ordering 3 or more CDs direct from Crépuscule. All Les Disques du Crépuscule CDs packaged in standard jewel boxes ordered direct from us are shipped in a special card slipcase, not available in shops. To check payment methods visit the Crépuscule mailorder page.